-Authentic pack racing action, with an incredible 16 car grid in single player races and up to 16 player online races, a first for iOS. -30 meticulously detailed licensed cars, including the 2010 Ford Shelby Mustang GT500, 2010 Nissan GT-R (R35) and 2012 McLaren MP4-12C. 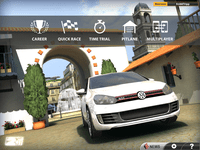 -A full game experience including a massive career mode with well over 10 hours of gameplay. -Cutting edge graphics and physics powered by our exclusive, high performance Mint3D™ engine.